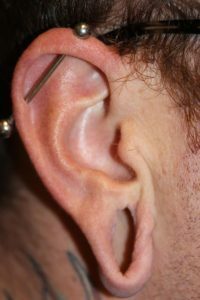 Gauged earlobes are still a quite popular form of extreme body modification. 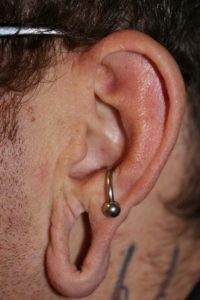 It seems that over time and with the number and types of people who have had gauges, it has largely lost its shock value or statement of individuality and has become almost mainstream although a bit on the fringe. This is particularly true when compared to other radical body modifications such as forked tongues, skin piercings, skin implants and even eyeball tattooing. 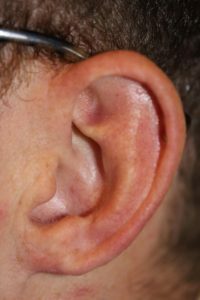 Those who choose to gauge their earlobes are typically in their teens and twenties, rarely thirty or older. Many of those who have done this ultimately see the light of day (perhaps through the large openings in their ears! 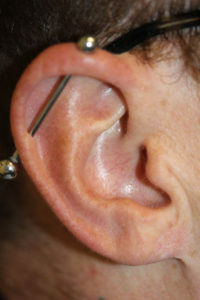 ), have finally “grown up” or by necessity (see below) decide to remove their gauges and may even seek or need to have their stretched out, deformed earlobes reconstructed. • Emotional maturation. Deciding that they are adults and are done with this phase of their life and want to move on and be more mainstream. • Financial. Yes, you can get a low paying job at Starbucks with gauges but you are far less likely to be hired for a very well-paying job such as in the financial sector or in consulting. • Education. You may have better prospects pursuing higher education without gauges in place – and will surely be taken more seriously. • Military and police departments. The military and many police departments mandate that you must not have holes in your ears such that light can come through. So, before you can enlist, your gauges must go and your earlobes be reconstructed. • Significant other disapproves. Virtually all the time, this significant other is the girlfriend, fiancé or wife. So if you know what is good for you – get it taken care of! • Role model. You have young children and want to be a good role model, etc. – so the gauges must come out. Can’t say that this is very common, though. • For a wedding (see #5). Again, guys, you just gotta do it! Sutures are removed at around ten days to two weeks though it can take up to two months for the repair to have reasonable strength. It will take at least several months for most of the swelling to subside and the area to contour more ideally. If you are considering doing away with your gauges and changing your image for any of the above reasons, you will be excited to know that the surgical treatment is easy, essentially painless, associated with virtually no down time and with great long term results (when performed by an experienced board certified plastic surgeon). And the price – affordable for most everyone.